P67 4wd "P670P" 1.5litre V-8 (now fitted with a 2 litre engine). Designed by Mike Pilbeam with Furguson four wheel drive system. Practiced by Richard Attwood , British GP 1964 but not raced. The car was later used by Peter Lawson to win the 1968 British Hill Climb Championship. After a later hill-climbing "write-off" accident the car recieved a complete rebuild for the Donnington Collection. The Tony Rolt & Claude Hill Ferguson Project 99 from 1961 was built as an engineering test bed to publicise the Ferguson four wheel drive system in competition. When they withdrew from racing, the technology was available to other teams. BRM number one driver, Graham Hill, had raced the P99 and suggested that Tony Rudd build a 4WD car. Rudd was not convinced that a 1.5 litre F1 car would benefit from 4WD. Sir Alfred Owen stated that his team was racing to demonstrate the groups engineering powers and authorised £10,000 to design the project. BRM were the team with the engineering facilities required and were in business to publicise the skills of Rubery Owen as one of the major manufacturers of the UK. Was this an advantage or not? BRM always looked to engineer a solution to its tasks  Lotus were still basically a workshop that used their skills to avoid the need for a high-tech solution. Which was the best way to work? Perhaps different teams had different goals. 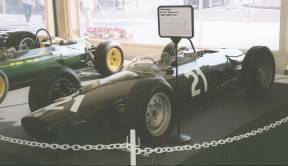 In 1964 BRM were looking forward to the 3-litre formula for 1966. Thinking that a doubled engine size with a doubled engine power would be too much for the standards of tyres & suspension of the time, four-wheel drive looked like something for the future. BRM had been consultants on a (never completed) Chrysler V8 4WD Indianapolis car and Sir Alfred gave the go-ahead for the construction of a F1 4WD BRM. Mike Pilbeam was a new graduate working on suspension calculations for the P261 (using a computer of the Rubery Owen group  something new and exciting in 1964 !) Pilbeam, as his first big project, designed a space-frame chassis and incorporating the Ferguson 4WD system and the 1.5 litre V8 engine turned through 180 degrees to provide a central power take off. Torque was split 50/50 with propshafts running front and back on the left hand side of the car. The car was based on the World Championship winning P578 and used many existing components. Compared with the then current P261 monocoque the P67 was complicated and overweight by about 150 lb. In tests by Dickie Attwood at Snetterton the 4WD top speed was 8mph slower than the P261. The P67 was entered for Grand Prix novice Dickie Attwood in the 1964 British GP (along with Graham Hill and Richie Ginther in their usual P261s). The pole position time was 1min 38.1 sec. - Attwood was 24th and last car with a time of 1min. 45.2sec. That was 0.2sec. behind 23rd place Tony Maggs in a Centro Sud BRM  of the type that the P67 was developed from. BRM withdrew the P67 from the race and the car never started a race for the team. The 1966 3 litre H16 engine was built with provision for a drive shaft to pass through the engine should a 4WD version be required  it was never used. The advent of fat tyres and wings provided a crude but effective method of transmitting F1 power to the ground. In 1967 Peter Westbury and David Good dusted off the BRM 4WD test-bed. Westbury, having used the 4WD Ferguson P99 to win the RAC Hill Climb Championship of 1964, would have been well qualified to find a place where the cars F1 liabilities could prove to be assets. David Good drove the car (with a 2 litre engine) in a number of rounds in 1967. The first round at Loton Park provided Good with only eighth place. The wet rounds two and three at Prescott & Winscombe Park were won by Good in conditions suited to 4WD traction. The fourth round at Barbon Manor was dry and provided Good with another win and a score of three out of three in a car now tuned to perfection. Round five at Shelsley Walsh provided a seventh place finish. The sixth round at Rest-and-be-Thankful resulted in a solid second place and gave Good the championship lead at the half way stage. Sadly the second half of the season did not produce the the same results for the P67 and the car was passed on to Peter Lawson before the season was over. Peter Lawson had bought the car before the end of 1967 and prepared for the following year. 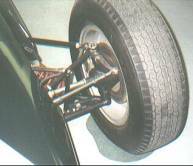 Lawson had the car fitted with a 2.1 litre Tasman engine and revised the 50/50 torque split to a 30/70 rear bias, giving improved traction and a reduction in under-steer. Lawson started off the 1968 hill climb season badly with a crash in the first round. From then on Lawson dominated the championship winning every other round except one where the car was out of action. Just a thought --- BRM mastermind, Raymond Mays, was himself a past hill-climb champion. Just a thought --- Mike Pilbeam later set up his own racing factory in Bourne  becoming famous for his hill-climb cars. V1.5 - 20 June 2002. © David John Hodgkinson 2000-2002. All rights reserved.